Let’s talk about how this is the first time I’ve cooked fish at home. I know, it’s about time! But I was nervous…that it would smell the place up, that I would cook it wrong, that I wouldn’t cook it enough, and what do I do with the skin? !…so many irrational fears. 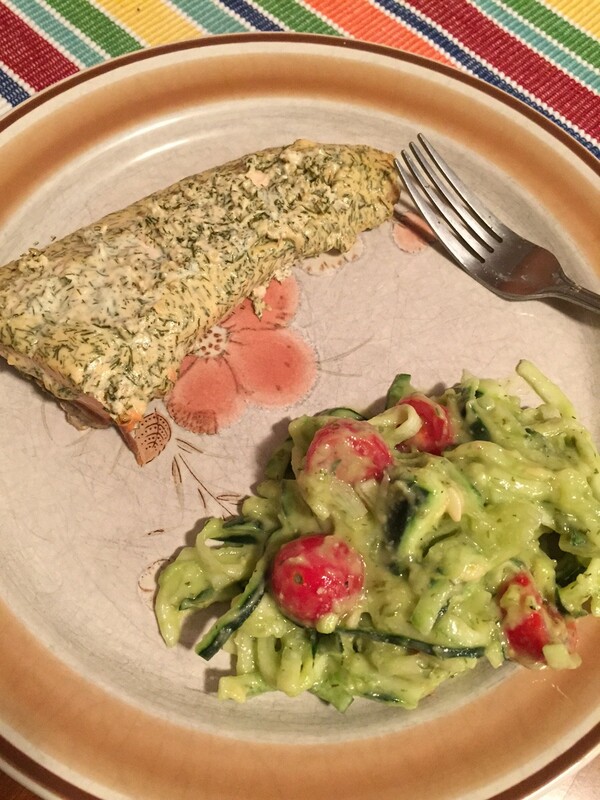 I found a recipe for salmon in Cooking Light that seemed super easy and sounded delicious. Too good to be true? NOPE! Simple, delicious, and easier to cook than most poultry or beef. The sauce was SO GOOD and the fish cooked so easily and quickly. Like walk in the door, have a meal ready to eat in 20 minutes quick – there’s nothing better than that! Since I cook just for myself, I only cooked one fillet at a time. 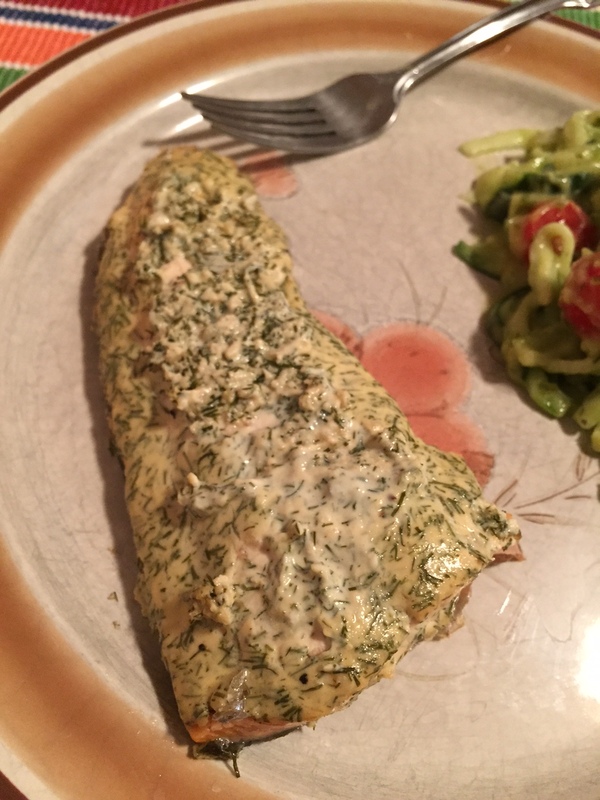 I usually make a meal and then eat leftovers all week, but I knew the fish wouldn’t reheat well. So I just made the sauce in a big bowl and kept the raw salmon in the fridge, and each night I cooked one fillet and smothered it in sauce. 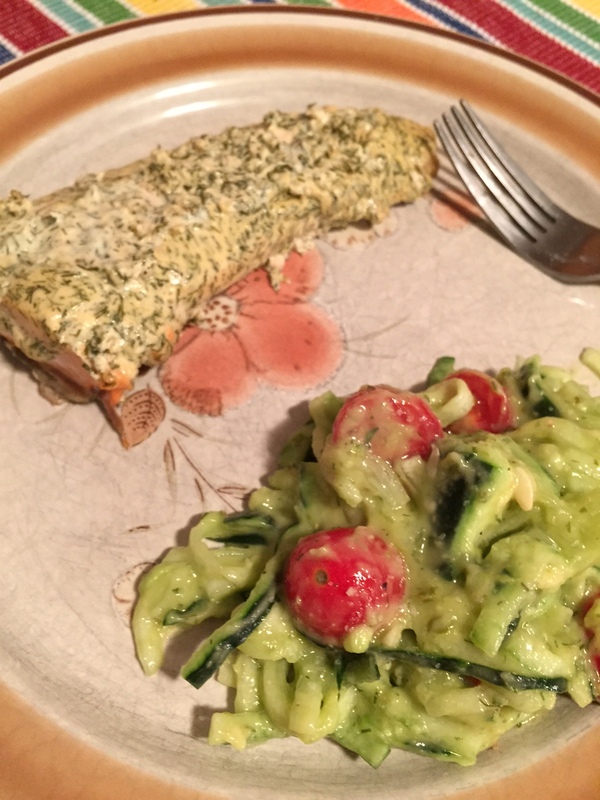 Easy and so yummy – my mouth is watering thinking of the sauce right now. 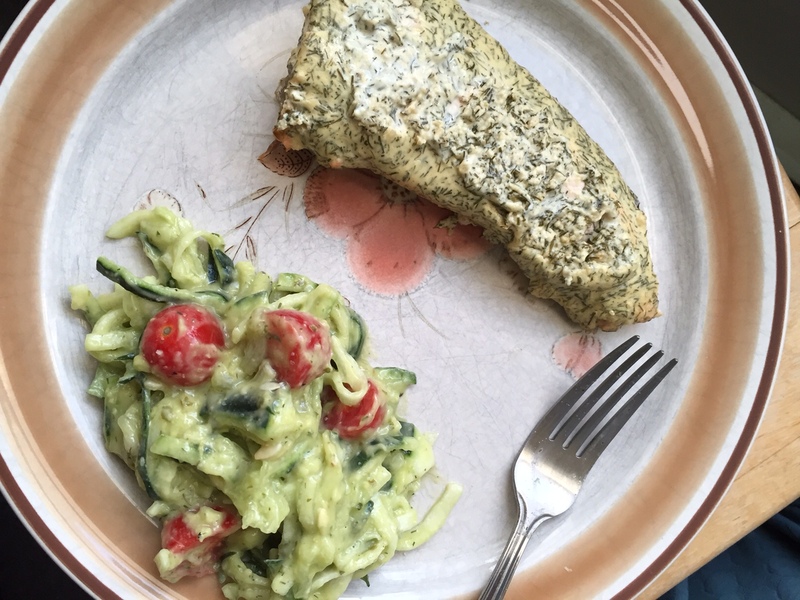 I served the salmon with a spiralized cucumber salad, which is a great way to turn garden-fresh veggies into a nice, light side dish. 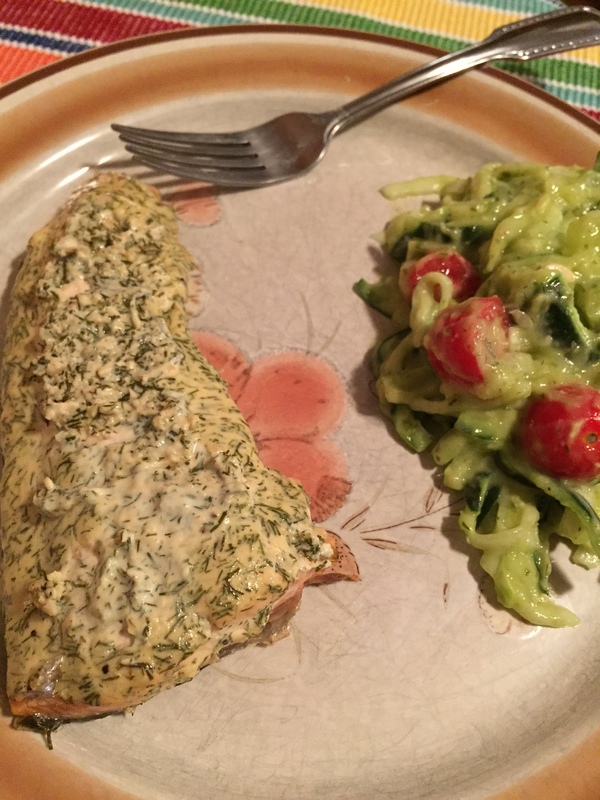 Make this meal ASAP – you won’t be disappointed! 1.) 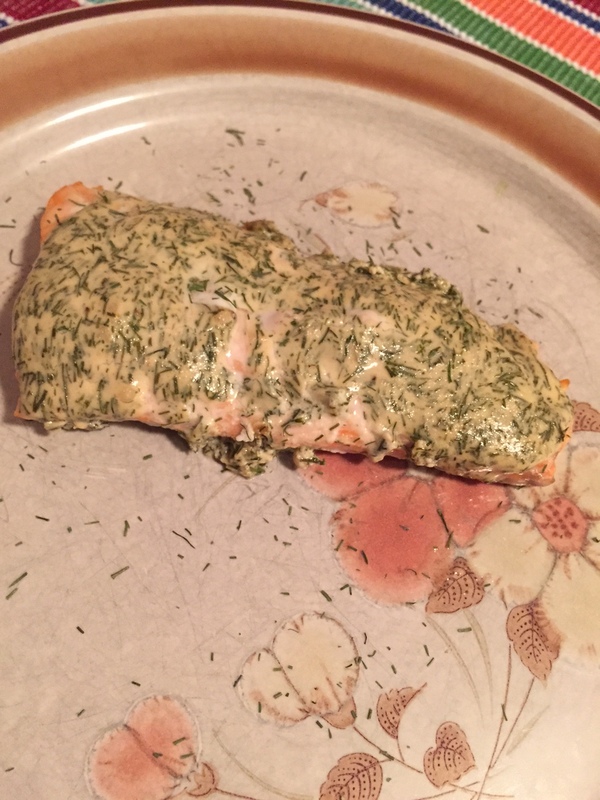 Preheat oven to 425 F. Separate or cut the salmon into 3 fillets. 2.) Combine first 8 ingredients in a small bowl. 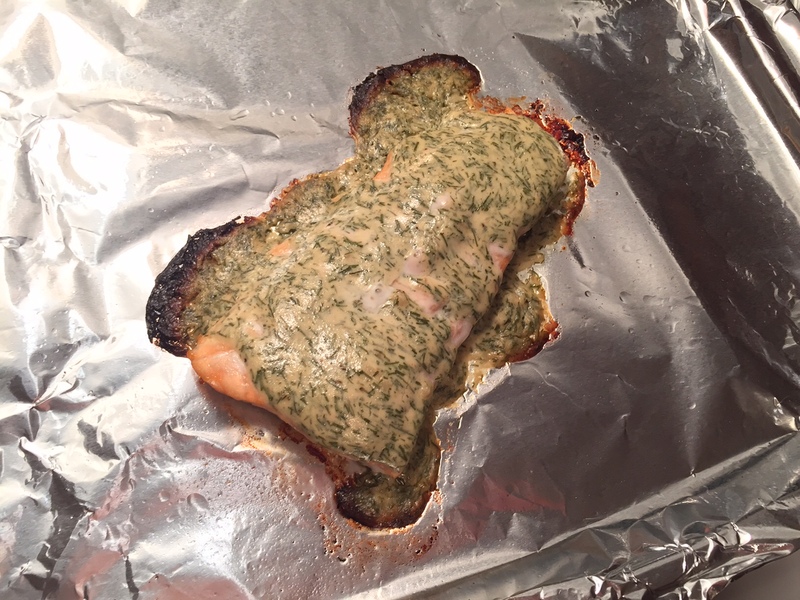 Place desired number of fillets, skin/skinned side down, on a foil-lined baking sheet sprayed with cooking spray. 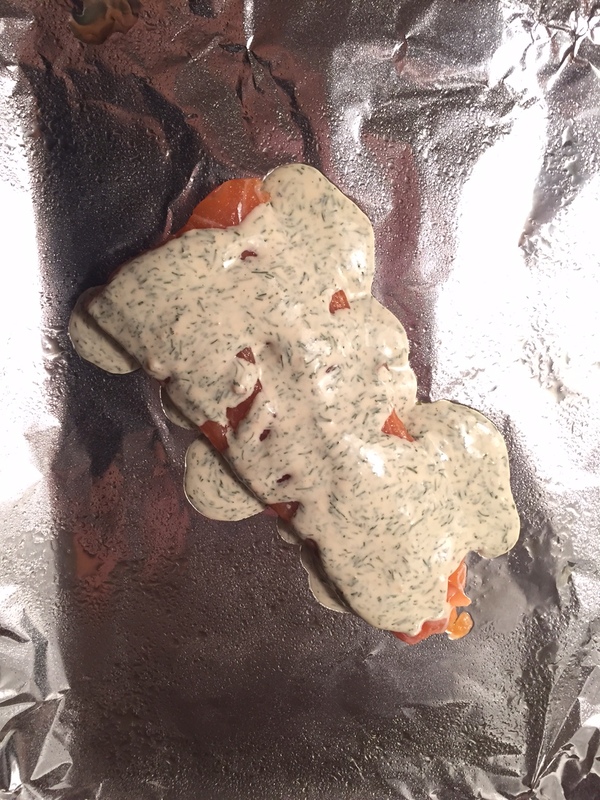 Spread yogurt mixture over salmon. Bake for 10 minutes or until desired degree of doneness. 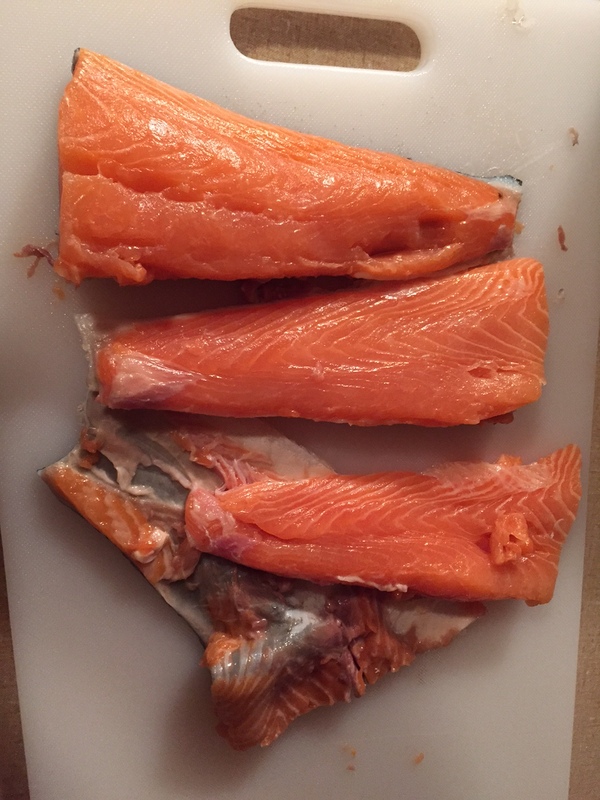 ** I decided to try the salmon both with the skin and skinned…I liked the taste of both, and both were very moist and delicious. Just keep in mind the skin adds more calories. So use whichever method you prefer! 1.) 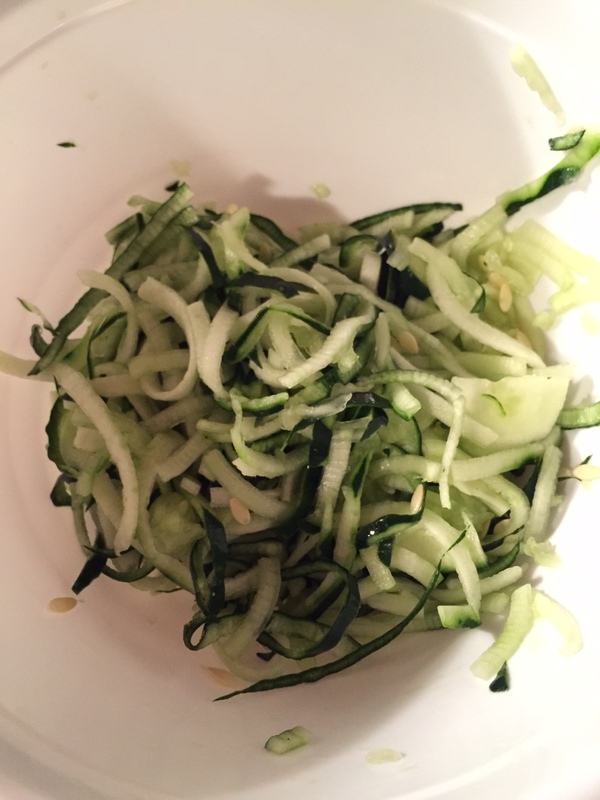 Use a veggie spiralizer to turn the cucumber into “noodles”. Chop them a bit in a small bowl to make them into smaller noodles. Cut grape tomatoes in half and add to cucumber. 2.) 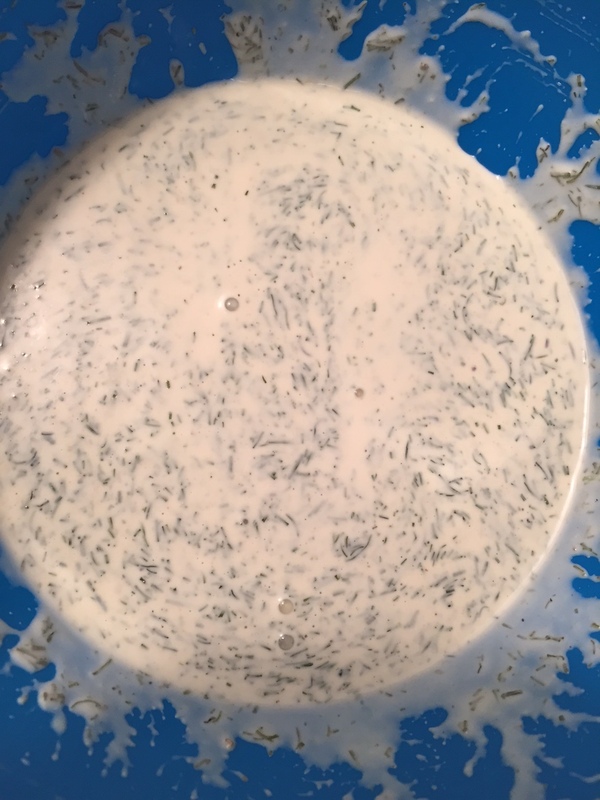 In a blender, add the rest of the ingredients and blend well. 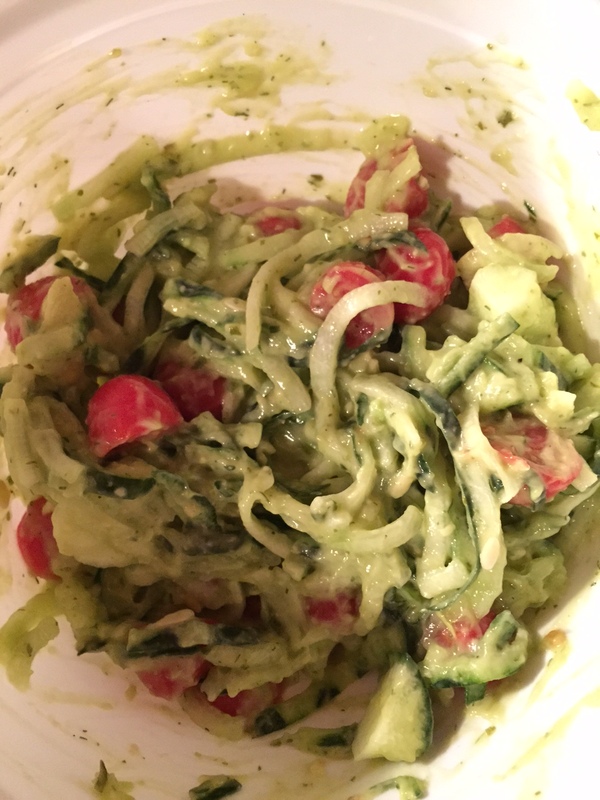 Pour over the cucumber and tomatoes and mix together. Season with salt and pepper to taste. You may have noticed that I have stopped putting the calorie/nutrition information for my recipes. This is mainly just because I have stopped trying to track calories and nutrients since, for me, I end up getting too obsessive over this. 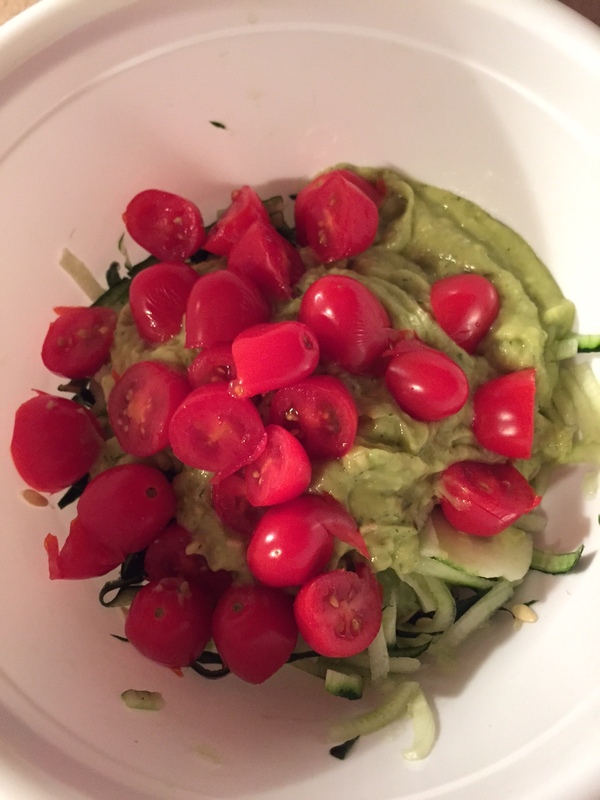 I lose sight of the real reasons I like to cook healthy foods, which is to make me feel healthy and energized, and instead I start eating things just because they will help me fit my macros or hit my calorie goals. Like a Thin Mint is less calories than an apple, so if your focus is just calories, you pick the cookie. But the apple is obviously the way more nutritious choice! I’ve started listening to my body and eating what my body craves until I am full, which usually ends up being a smaller serving than I may have previously eaten. And if I want a cookie, I have a cookie, and if I want an apple, I have an apple! However, if you all think having the nutrition info is helpful, I can keep doing it. Let me know what you think!